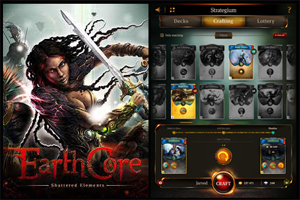 Earthcore: Shattered Elements is a new digital collectable card game (CCG) for mobile devices designed by Tequila Games with consultation from Neuroshima Hex designer Michal Oracz. The game has received extremely positive reviews by users on both stores that it is currently available on as well as by the review press. The game is praised for having high production values, good art, simple to learn but difficult to master mechanics, very fast games (average around 5 minutes) and a reasonably fair business model. The base mechanics of the game differ from most common ccgs. The combat is based on rock/paper/scissors, with each card belonging to one of three factions based on the elements of earth, fire and water or a forth neutral element called dust. Cards can also have special abilities called skills, up to 3 of which can exist or be crafted on to a card. 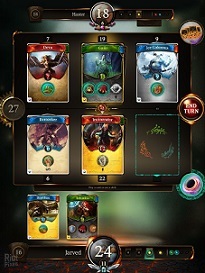 players take turn laying out their cards in one of 3 lanes, then use skills to modify card positioning and game rules and lastly combat is resolved. The more powerful a card is the higher its risk factor, which effects how much damage it can do to either you or your opponent depending on who wins the combat in the lane the card is played. The object of the game is to bring the opponent's life total to zero. Earthcore: Shattered Elements is free to play so there is no risk in checking it out. 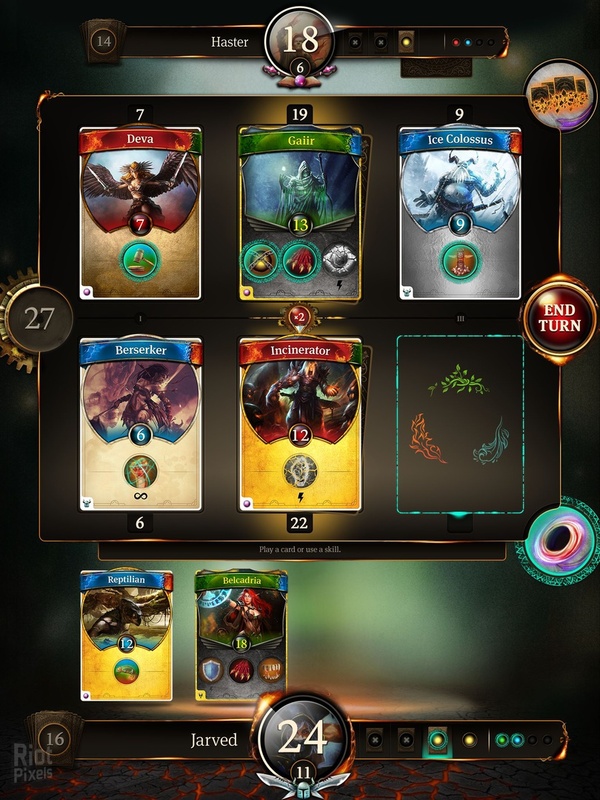 Quite a bit of free single player content is included which rewards the player with many cards to help them start to develop a deck. Extra cards can be used in crafting or spent in a lottery for prizes or better cards. There is a lot of game to be played here without spending any money, but like with any CCG it is likely you will need to invest some money to be competitive at higher levels. A short audio overview and review of Earthcore by TotalBiscuit is available on Soundcloud.